Hello All! I had great intentions for this post to appear this weekend- but I pretty much just relaxed and accomplished a whole lot of nothing instead. I swatched and took photos for 3 different posts on Friday- so really laziness was truly the only excuse! I’ll be posting the normal Mani Monday later today, but first I wanted to be sure to get this preview post in asap. I’m going to be showing off 2 colors from 365 Days of Color’s new collection, Toxic Love: Deadly Attraction and Dangerously Beautiful! 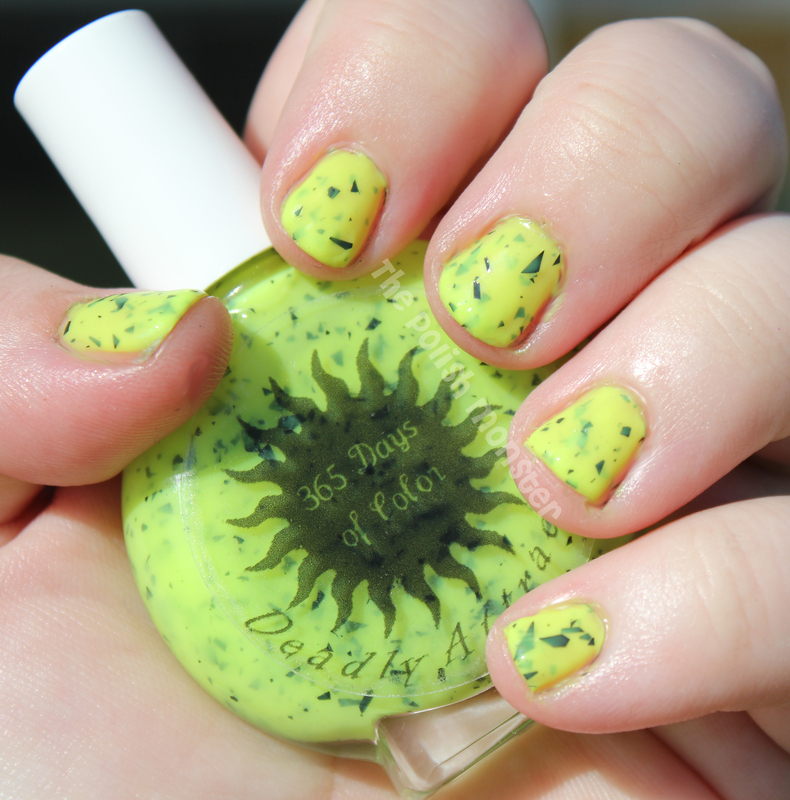 365 Days of Color is an indie polish brand created by the awesome Sunny. You can find her website here: http://www.365daysofcolorpolishes.bigcartel.com/. She’ll be re-opening her shop on Monday, July 16 at 8am PST (11am EST and 10am CST)- including these new colors! First up is Deadly Attraction! This polish is a neon yellow filled to the brim with black shard glitter. If you’re a shard lover like myself, you’ll quickly love 365 Days of Color- Sunny uses shards in a number of her polishes, 2 of which I’ve swatched in the past here. Application was alright. I had a bit of thickness issues with both colors. I was ready to contact Sunny to let her know- but in the meantime I used 3 other colors (I told ya’ll, I have swatches ready for a few posts) and every single color had similar thickness issues. And it wasn’t initially- it was after I opened them and did maybe 1 coat on my nails. My Zoya Lara tonight also had issues with thickness. I think my bedroom is bizzare and making my polishes thicker. Maybe our air is dry? Go figure, maybe one of ya’ll may know something that could cause that. Or maybe all the ones I used are just running on the thicker side. Point is, I can’t say for sure that it’s the polishes running thick. Even thick, they went on well. Both colors are on the sheerer side (they’re jellys- or maybe crellies? ), so all photos show 3 coats. You could also layer 1 coat over underwear, but you won’t get quite as much of a ‘sandwich’ effect. There’s a slight flatness to the front and back, so if you were to have multiples of these bottles, they line up perfectly next to each other. If all my bottles were this shape it would certainly help with space issues! Dangerously Beautiful is a neon pink with a sparse amount of blue and black matte glitter. The pink is definitely neon, but it’s very subdued and not blindingly bright. I’ll be completely honest- before I put this on, I didn’t think I would like it. With glitter I tend to go with the ‘more is better’ mantra, and I knew this would be a very light glitter. I also wasn’t sure if I would like the color combos. However- I actually think this is my favorite of the bunch! It looked really, really super beautiful on, and I hated to have to take it off. The blue and black glitter looked lovely with the pink, and the glitter in lower layers appeared purple because they were underneath the thin pink layer. These 2 colors along with the other colors in the Toxic Love collection- Chemical Romance (purple with black shards, black/white glitter) and Killer Kiss (coral orange with white shards, bars, and multi sizes of hex glitter) will be available today at 8am PST at 365’s Bigcartel site. You can follow 365 Days of Color on Facebook to keep up to date on restocks and new colors by liking the page here! At the excellent request of a follower, I’m now linked up on Bloglovin’ (or I think I am). You can follow me here now if you would prefer that. I’ve added a widgit to the sidebar as well. See you in a little bit for Mani-Monday! It’s going to be ‘monster-ful’ fun today! This entry was posted on July 16, 2012 by The Polish Monster. It was filed under Uncategorized and was tagged with 365 Days of Color, flakies, glitter, indies, shards, Toxic Love. Just ordered this collection in minis plus a full sized laffy taffy and summer dream (I have a thing for minty greens apparently…I counted the other day and I have 5 BUT I don’t have any with glitter yet :). Yayyyy! I actually didn’t get the other 2… I sort of had a last minute ‘don’t spend money!’ moment 😉 I just grabbed another Birthday Bash to use for a giveaway, and some more cuticle balms!